and sense your thoughts. 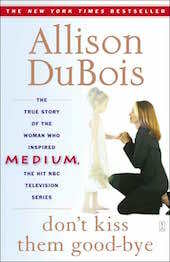 These are some of the extraordinary gifts that define the remarkable Allison DuBois, the real-life medium, wife, and mother whose life is the inspiration for the hit NBC television series Medium. When she was six years old, Allison’s deceased great-grandfather came to her with a message for her mother: “I am okay, I am still with you. Tell your mom there’s no more pain.” Allison shared his comforting words with her mother and thus began a lifetime of creating connections between loved ones and those they have lost. The purpose of her gifts became clearer when Allison worked as an intern in the homicide bureau of the district attorney’s office and found that she visualized the crime as she handled the evidence. Allison now works as a profiler on criminal investigations. In this stunning book, Allison shares fascinating stories of her encounters with people who have passed and her adventures as a profiler for various law enforcement organizations. With wit and compassion, Allison shows us what it is like to live with these special gifts and talents and also tells about her struggle to live a normal life as a devoted wife and mother. She shows how learning to accept her own gifts has helped her accept the unique gifts of others and how her compelling desire to relieve the pain of others has helped define her own life, a life committed to the search for ultimate truth. If you have ever questioned whether there is an afterlife, this book will help you see that there is a living energy beyond death.